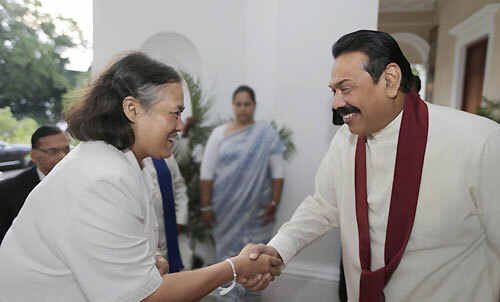 Her Imperial Highness Princess Tsuguko of Takamado, the eldest daughter of Japanese Prince Takamado and Her Royal Highness Princess Maha Chakri Sirindhorn of Thailand called on President Mahinda Rajapaksa this evening (20) at the President's House in Kandy. Sri Lankan President received Royal Princesses in two separate occasions before commencing of the final Randoli Esala Maha Perahera of the Sacred Temple of the Tooth Relic. 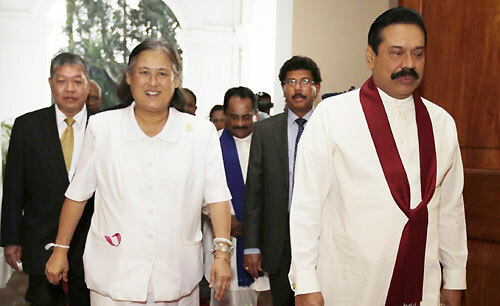 Thai Princess Maha Chakri Sirindhorn and Japanese Princess Tsuguko of Takamado arrived in Sri Lanka Monday on a four-day official visit at the invitation of Sri Lankan President Mahinda Rajapaksa. The visiting princesses of Japan and Thailand paid homage to Sri Dalada Maligawa (Temple of the Tooth Relic) in Kandy earlier this afternoon. They were warmly welcomed by the Chief Custodian of the Maligawa (Diyawadana Nilame) Nilanga Dela. The two Royals will have the opportunity to attend the final Randoli Perahera tonight on Nikini Full Moon Poya Day. President Rajapaksa and First Lady Shiranthi Rajapaksa also hosted a banquet this evening in honour of Princess Maha Chakri Sirindhorn of Thailand. The Thai delegation included the Ambassador of Royal Thai Embassy in Sri Lanka, Mr. Poldej Worachat. Japanese Ambassador in Sri Lanka Mr. Nobuhito Hobo, Governor of Central Province Tikiri Kobbekaduwa, Minister of External Affairs Prof G.L.Peiris, Chief-of-Staff to the President Gamini Senerath, Several other government ministers, parliamentarians and dignitaries were present at these occasions.